The placement of sculpture in hospitals can be something of a contentious issue with people who believe that the NHS should not be spending money on works of art. However, it is the general rule that these are funded by charitable donations from those who feel that providing a pleasant and uplifting environment is beneficial to the well-being of staff and patients alike. Indeed, it is often the case that grateful relatives will donate a sculpture in memory of a loved one. Over the years a number of my sculptures have been placed in hospitals at home and abroad. 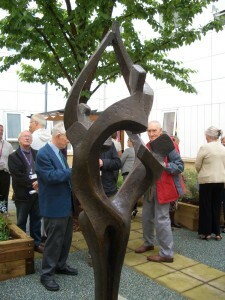 The first sculpture was ‘Unison’ at Weston Park Hospital, Sheffield, purchased by a former doctor who was retiring from working there, whilst the second, ‘Love of the Family’, was purchased for the Children’s Ward of King’s College Hospital and presented by the Variety Club of Great Britain, an organization well-known for their charitable work. The Jeffrey Kelson Centre at the Central Middlesex Hospital has collected a wide variety of artworks including four of my sculptures, a decision which is discussed further on the ‘Sculpture in Situ’ page of my website, and a few years ago I presented a reclining figure, entitled ‘The Listener’ to my local hospital here in Barnet, and which resides in one of the courtyards. 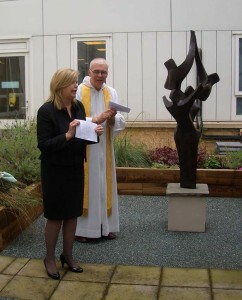 In the past year, two hospitals have purchased sculptures for the quiet gardens of their cancer units. The first ‘Celebration ll ‘ is now in place in the Kaufman Centre, Upper Chesapeake, Bel Air, Maryland, USA. It is always a pleasure to be asked to install a sculpture in a hospital setting, and this May I was delighted to be present at the unveiling of my work in the courtyard garden of the Pine Cancer Unit of the Darent Valley Hospital in Dartford Kent. This garden was created as a place of peace and calm for patients to use whilst undergoing their chemotherapy or having private conversations with their consultants in the summer house. The idea was the inspiration of the Reverend Martin Kelly, the Senior Chaplain Counsellor of the Dartford and Gravesham NHS Trust and Sarah Collins and Head of Cancer Services who researched a number of sculptors in order to make the most appropriate decision. Sculpture in hospitals has been proved to be of benefit in many ways; for an artist it always promotes a good feeling to know that one’s sculpture enhances an environment and gives pleasure to those who are experiencing difficult times.